Japanese history is unique in that the capitol has changed several times throughout history. Currently the capitol of Japan is in Tokyo, but throughout Japanese history it has been located in Kyoto, the ancient city of Japan. 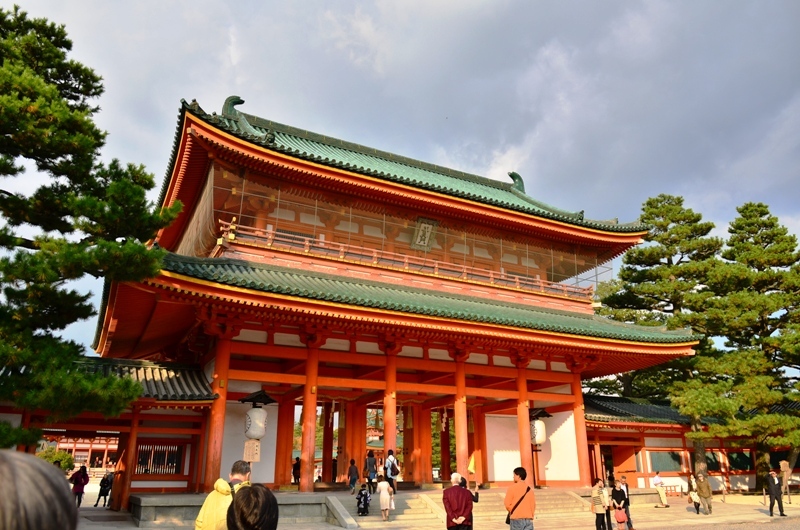 Heianjingu was constructed to celebrate exactly that: Kyoto as the center and capitol of Japan. Although it is not the capitol today, Kyoto is still arguably the cultural and traditional capitol of Japan and retains much charisma and influence over all of Japan. The buildings within Heianjingu are modern interpretations of the Heian Palace that actually existed more than 1000 years ago. Heianjingu was built in the late 19th century to commemorate the change of the capitol to Kyoto, and enshrines both the Emperor Kanmu and Emperor Komei. The spaciousness of the Heianjingu will take you to a magical, mystical time in Heian Period, an era filled with poems, art, and romance. 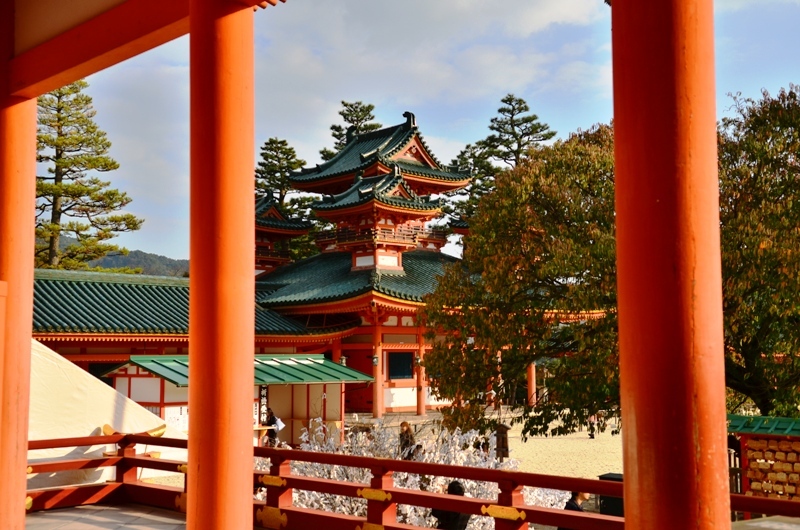 Red, one of the symbolic colors used in Japanese tradition, is visible throughout the shrine and other buildings in the vicinity. Step one foot through the gate, or “tori’i” and you will enter into a shrine that definitely is secluded from modern and contemporary Japan, yet filled with new interpretations of what life in the Heian Period was or would have been like, if one were ever to live and experience the mysterious life as a Palace resident. One of the main attractions of the Heianjingu is its amazing garden that showcases almost every aspect of Japanese gardening. Heianjingu Garden is arguably the most important and renown garden created in the Meiji Era, and it carefully takes a visitor through the four seasons by exposing him or her to various plants, flowers, and living creatures that signal a particular season or time of year, such as cherry blossoms and maples. The garden is made up of four smaller gardens, each located in the East, West, North, and South. Each has its own lake within, and these lakes pull water from Lake Biwa, the biggest lake in Japan. Thus, some of the organisms living in the gardens’ lakes are the same as those in Lake Biwa. 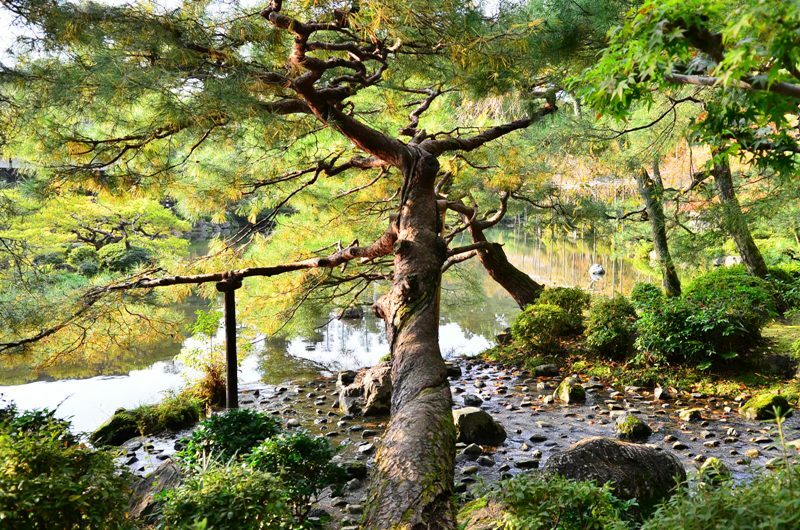 As with other Japanese gardens, each tree, bush, or rock is carefully designed and placed to create an artful, contemplating landscape. Trees such as this one, which might be cut and trimmed if it were in a western style garden, is preserved as much as possible by having support underneath its branches. 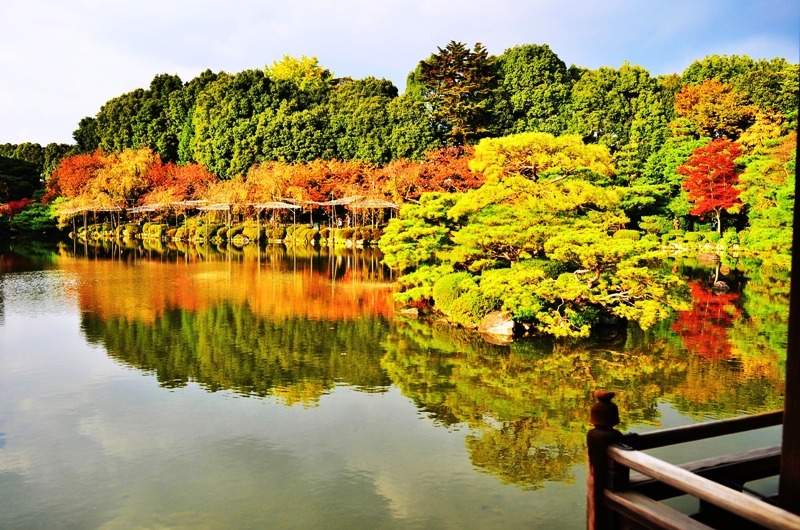 One of the most famous attractions of the Heianjingu Garden is the Taihei’kaku, a bridge that connects the gardens. The view from this bridge overlooking the lake is phenomenal. 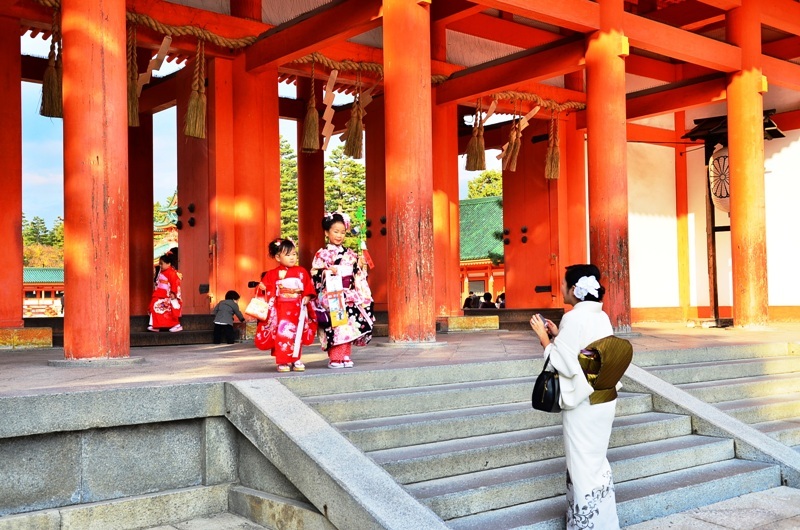 Make your experience even more authentic and eccentric by wearing a kimono or a yukata to stroll through the park. 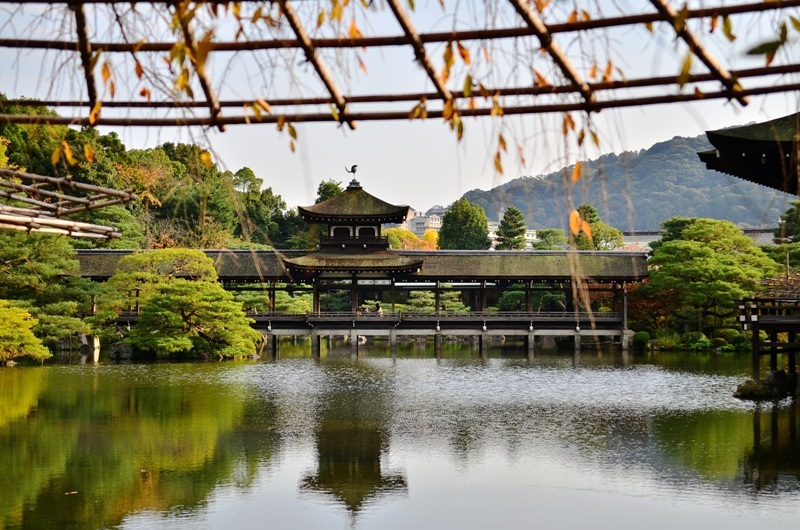 You are guaranteed to feel like a Palace resident of the Heian Period, strolling through the magical gardens and pondering about what fun activities to do that day. One of the best time to visit Heianjyo is undoubtedly during the fall. Japanese foliage is world famous, but it’s often difficult for a first time visitor to Japan to pick a place because 1), there are so many places to see foliage, and 2), some of the places are difficult to go to because it is high up in the mountains. Thus a garden that presents foliage is perfect and easily accessible; just be warned that it will be a little crowded because the Japanese LOVE foliage and people will be visiting not only from all over the world, but also from all over Japan to see the magnificently colored trees and leaves. Another perk to visiting a Japanese shrine is the festivities and rituals that take place. This is a coming of age ceremony that Japanese girls and boys celebrate; girls celebrate when they turn three and seven– boys when they turn five. The kimono attire that the children wear for this ceremony is highly festive and ornamental, as can seen in the photo below. Another highly popular, photogenic scene at a Japanese shrine is the “miko,” a shinto priestess who performs rituals and other activities. They are noticeable because they wear a bright red hakama (Japanese traditional pants) with a crisp white kimono. Mikos are not always outside and about because they have activities to tend to inside the shrines, so you will only be able to see them if you are lucky! 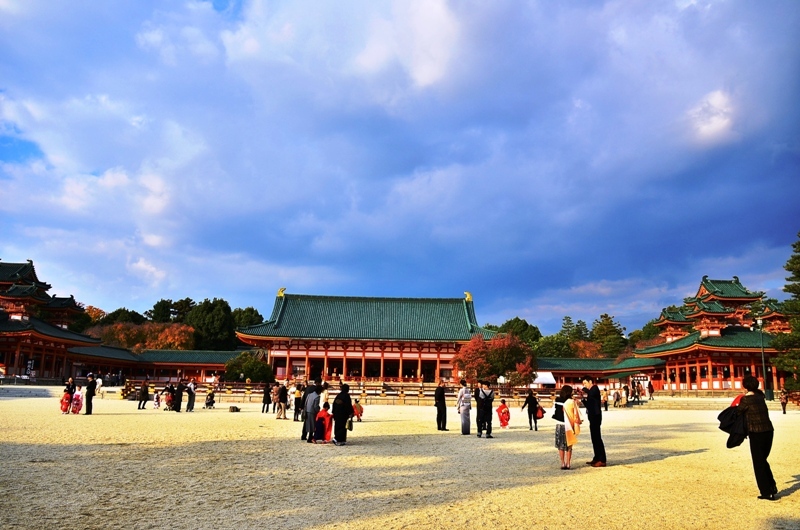 Visit Heianjingu And Experience Japanese Tradition Now! This blog doesn’t do justice to explain the magnificence and grandeur that the Heianjingu will present to you. 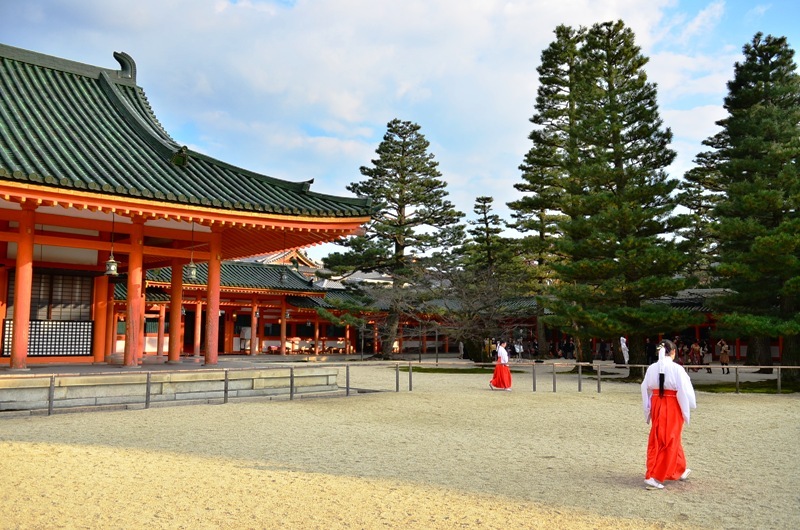 However, one thing is certain– this shrine is one of the few shrines that have interpreted how an old Palace from the Heian Period actually looked like and brought it back to life to be enjoyed and cherished by the contemporary world. 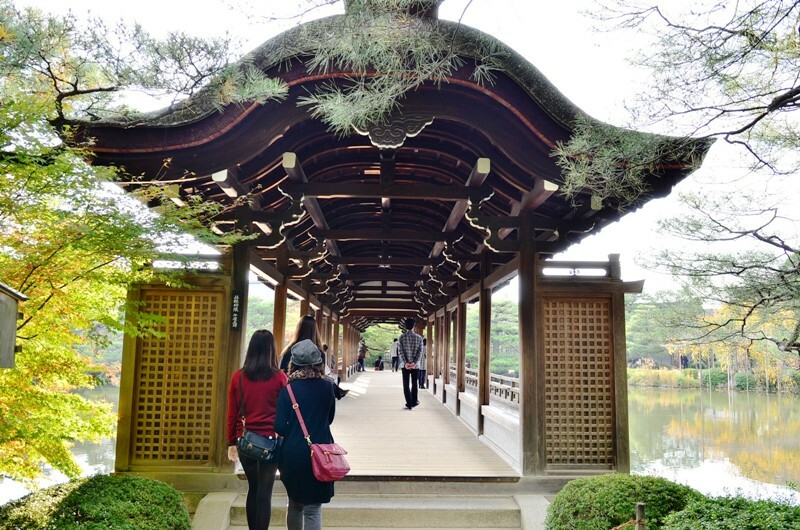 It has all the elements that a Japanese Palace would have had– beautiful gardens, bright red structures, and most of all, locals who come and pay homage to celebrate life. Come be part of it by making Heianjingu part of your travel plan.